Suppose over millennia (or as long as it takes) humans on Earth are artificially selected by aliens to be big and healthy. Is there any theoretical reason that they couldn't grow to be as tall as large dinosaurs? If the proportions (thickness of bones etc.) had to be changed, what would those changes have to be? A target height would be about 26 ft (8 m) but the taller the better. They must be able to support their own weight and walk easily and bipedally. The giant-sized humans should still be recognisably human even if their proportions are somewhat different - for example they might be stockier or spindlier. The aliens will provide the humans with all the food and comfortable living conditions necessary. Only the healthiest and largest humans are allowed to breed. There is no manipulation of DNA, just selective breeding for size. This occurs on Earth and on land so everything happens in 1G. Possible, maybe, but with some caveats. They will only look vaguely human. Their proportions will be drastically different the square cube law is unforgiving. Their legs will have to be massive to hold up the weight, luckily humans are plantigrade. They have to compensate for scaling difference but they also need to account for the much larger heart and lungs. Expect legs 2-3 feet in cross section at a minimum, and they will need some serious shock absorption in the feet. The internal anatomy of the legs will have to be massively reworked to keep fluid from pooling in the legs. Giraffes have a thick inelastic structure around each leg to prevent expansion of the tissue. Their lungs and heart will need to be much larger proportionally, the body is basically a fluid column, and the heart needs to overcome that massive pressure differential, that's why humans with gigantism have huge hearts and still die of heart failure. Their entire circulatory system is going to need tweeking, because that massive pressure going to the legs is also going to the brain, they will need some kind of adaptation to keep this pressure down in the head or they will bleed into hteir brains. Their heads will be smaller proportionally, brains scale less than one, so bigger bodies need smaller brains proportionally to get the same functionality. I mentioned the lungs, mammalian lungs are crap (dead end sacks). One of the reason dinosaurs got so large is they have a very different breathing mechanism, their lungs are highly efficient stiff one way structures fed by air. Your creatures lungs will have to be huge, and not just because of the amount of oxygen they need to extract, they also need to move all the air out of a much larger esophagus before they get any fresh air. This is why giraffes have such disproportionally massive lungs. The single biggest problem however is the spine, This may be what stops them from getting to the size you want. The mammalian spine has been seriously compromised by the mammalian breathing system. Having to have a portion of spine unsupported by ribs makes for a very weak structure. dinosaurs did not have this problem. The spines for your giants will be proportionally gigantic, and even then their is going to need to be some serious changes, something closer to a ball and socket joint between vertebrae, or perhaps a bunch of interlocking joints like a hero shrew, will necessary to prevent dislocation. That will take a long time to evolve, probably more than anything else. The musculature supporting it will be equally massive, all together they may not even be able to bend their spine much. It will have some big impacts on their lifestyle. If your humans stand up from a sitting position they will likely pass out, giraffes have a similar problem because it is a drastic change in pressure. Their spine is going to be very stiff just to work, they may not be able to bend over. Don't expect them to move fast either, swinging their arms in a pitch will tear it out of the socket and rupture every blood vessel in it. Of course they will also spend a lot more time growing, expecting adulthood to take 40 years to reach would not be unreasonable. Food is not an issue, animals get more metabolically efficient as they get larger. It is going to take a long time to create them, tens of millions of years at a minimum. These are some massive changes and they will not evolve quickly. It took sauropods ~30 million years to reach massive sizes, even with selective breeding half as long (15my) is not unreasonable. Assuming we are talking about on earth & the aliens haven't relocated their breeding stock to a planet with some combination of lighter gravity & denser atmosphere. It very much depends on what you mean by "still look human" but for 8 meters tall I'd have to say. A human bipedal bodyplan is extremely maladapted for a size more than a little over seven feet tall. 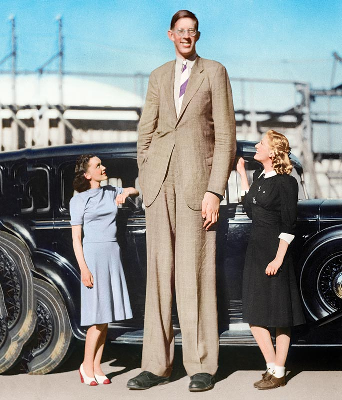 Robert Wadlow had a whole host of health problems associated with his size, he couldn't walk unaided for more than very short distances, the pressure caused by all that weight on his bones & joints did a lot of damage to them & he had a serious heart condition as a result of his size as well. And he was only eight feet eleven inches, an 8 meter human is entirely out of the question. To go much over seven feet & hope to be reasonably functional the human body needs substantial re-engineering of its organs, the skeleton & limb structure (especially the legs) to a degree where the end result won't resemble a normal human anymore even if it was still broadly a bipedal humanoid. In short you can't just scale up the human body by selective breeding & suppress good adaptions (for the increased size) to maintain a "normal" human appearance, while allowing those good adaptions is going to result in a very significant change in the species appearance. Just scaling up the human form to 8 meters they simply wouldn't be able to walk without snapping their legs like dry twigs, not (as you specified) in earths gravity. If you allow sufficient modifications to occur during the selective breeding so that they can walk easily and bipedally then there's no way on Earth you would ever be able to show me a picture of one & for me to mistake it for a human*, even if you remove all indications of scale. *Which it wouldn't be, by then it would be a new hominid species. It depends on what you mean by "still look human". Picture the difference between a deer and an elephant: the elephant has a squatter shape, thick, pillar-like legs, wide cushioned feet, and numerous other adaptations that allow it to work at such massive scales. You could potentially get something that looks like a human to work on big scales, but its proportions will be distorted. It will be squat, muscular, and have proportionally shorter, thicker legs than a human. Although this might not be such a bad thing, after all a lot of artwork of fantasy giants and ogres have these very same distortions. Another interesting fact is that larger animals tend to retain heat better. These giant humans will probably fare better in cold climates. If you want them to live in more equatorial regions, some other adaptations typical of large African animals may be helpful, like large ears or a tendency to wallow in mud or water. As for how big they could get, now the speculation becomes harder to determine. But I'm going to go out on a limb and say that they can grow as tall (though not as massive) as any terrestrial animal that has ever existed, provided that their legs are around as thick as that animal's own legs. After all, a sauropod's front legs are strong enough to hold up the "slice" of dinosaur that is above its legs, so if you took a chunk of meat roughly the same size and shaped it into a human-ish form, it should still be able to support its weight at least...though balancing on two legs and walking may be a different story. EDIT: One caveat I didn't consider - you're going to need a proportionally bigger heart to move blood to the brain. Elephants can get away with a normal-sized heart relative to their body size because their head is on roughly the same level as their heart, but this wouldn't work for a species that holds its head above the heart. Giraffes have very large hearts with thick walls for this reason. This may cause some issues if you want to stuff it into a human-sized torso. Not saying it would be impossible, but it may place additional limitations on how big an upright biped can grow. Not the answer you're looking for? Browse other questions tagged science-based reality-check biology evolution humans or ask your own question. Can you simply scale up animals? Aliens are evicting us from the earth; how much time should they give us? Redesigning the human body to flourish on a high-gravity world? What Could Aliens Do To Devolve Humans With A Germ Line Virus?